Much like the movie itself, this may be one of the most anti-climatic reviews I’ve ever written. Almost all of the films in the Harry Potter franchise are of uniform greatness, and even the ones that aren’t at that level are still good movies. It may be one of the most high quality film franchises of all time, no matter what you think of the books or J.K. Rowling or the fanbase. 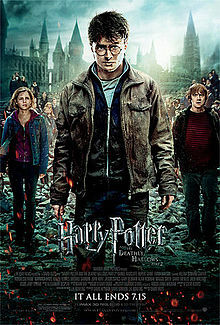 Director David Yates certainly put his stamp on the series, directing half of the eight movies, and all of them very well. He’s not going to see any thank you Oscars for his work (like Peter Jackson did for the unbearably long The Lord of the Rings: Return of the King when the one film in the trilogy that should have won Best Picture was The Two Towers), but they were all almost excellent fantasy films. Acting in a Harry Potter movie appears to be akin to being British Royalty, so I’m not going to write down everyone that performed in the movie ably well, because there was nary a bad actor to be found. Just look at how bloated the tags are on this movie, and you’ll see that there are tonnes of name actors that performed in it, and numerous young stars that hopefully still get acting work now that their meal ticket is done. It’s a gorgeously well-made film, although I do have a problem with about 30-40% of it appearing to be shot in pitch blackness. There were scenes where I could literally not tell if anything was going on at all. I can’t go 5 stars on it for that reason alone, but it’s a very good movie, and a fitting end to the franchise. It also didn’t feel as artificially stretched out as Deathly Hallows Part 1 did (for the record I gave that movie 3.5 / 5), and I’m a little sad that there won’t be anymore new Harry Potter movies to look forward to. That is until Warner Brothers finds a way to milk more out of the name. No movies, but there are still the books! I’ve read them all already and have no interest in Beedle the Bard or whatever!